A newly published peer-reviewed study reports U.S. wind turbines kill 1.4 million birds and bats every year, even while producing just 3 percent of U.S. electricity. The numbers reveal that President Obama’s global warming plan will kill hundreds of millions of birds and bats while doing little if anything to reduce global temperatures. Even if no new wind turbines are ever built, turbine blades will slice 14 million birds and bats to death in mid-flight during the next decade. However, global warming alarmists say we must reduce carbon dioxide emissions by 50 or even 80 percent. President Obama’s recently announced assault on climate change appears likely to seek such numbers. Given that most global warming alarmists also vigorously oppose hydro power, natural gas power and nuclear power, reducing emissions by 50 to 80 percent would require increasing the number of wind turbines roughly 25 fold. That means killing 350 million birds and bats in the United States every decade. Actually, the number of bird and bat deaths would likely be much higher than that. Wind turbines produce power on an intermittent and unpredictable basis, meaning conventional power plants must remain cycling on a constant basis to fill minute-by-minute fluctuations in wind power. That means electricity produced by wind turbines is far from carbon neutral. Also, wind power companies have already cherry picked the best locations to place wind turbines. As wind power companies are forced to build their industrial wind farms on less productive sites, each new wind turbine and wind farm will produce less electricity than its predecessors. Accordingly, producing 25 times as much wind power means building a heck of a lot more than 25 times more wind turbines. Looking at the direct consequences of all these new wind turbines, it is hard to visualize so many bird and bat deaths. After all, 350 million is a HUGE number. And that is not a one-time number. That is the number of birds and bats that wind turbines would kill every decade. How would bird and bat populations be able to sustain themselves under such an onslaught? The answer is, most bird and bat populations likely couldn’t sustain themselves, and President Obama’s climate plan would initiate an open-ended aviary holocaust the likes of which we have never before seen. Bald eagles, California condors and whooping cranes would be among the first to go. But it wouldn’t be just endangered and threatened species that would fail to sustain their numbers. Pretty much every kind of bird you can think of would race precipitously toward unsustainability, with many facing a very real threat of extinction. Bat populations would also be decimated. Bats are already in rapid decline due to white-nose syndrome, a cold-loving fungus that is decimating bat populations in the U.S. Northeast and is spreading westward across the country. Bat populations in the Northeast have declined by approximately 80 percent, and the 888,000 bat kills resulting from wind turbines each year aren’t helping the cause. Ramp up the number of wind turbines and ramp up the pressure on declining bat populations. Killing off so many birds and bats every year would have profound negative consequences beyond the mere deaths of birds and bats. Birds and bats are vital in keeping insect populations in check. Kill off as many birds and bats as President Obama desires and mosquito-borne diseases will assault Americans with striking ferocity. Crops will suffer under a growing onslaught of insect attack. Farmers will have to employ more and stronger pesticides to secure our food production. With wind turbines killing off so many birds of prey, infestations of rats and other vermin will also become more frequent and severe. Moreover, wind turbines require vast amounts of land to produce even a small amount of electricity. Even under optimum conditions, It takes approximately 400 square miles of land to produce as much electricity as a conventional power plant. Ramp up wind power production to replace conventional power plants and watch America’s remaining open spaces turn into whirring killing fields for birds and bats. If global warming actually threatened to destroy the planet, perhaps we would have to sacrifice so many birds and bats for the cause. But the reality is just the opposite. United Nations Intergovernmental Panel on Climate Change (IPCC) lead author Hans von Storch conceded earlier this month that computer models predicting significant future global warming cannot replicate recent temperatures and likely need to be adjusted downward to predict less warming. A panel of experts convened last week by Democratic Sen. Barbara Boxer agreed President Obama’s recent assertion that global warming is accelerating is not supportable by real-world facts and data. Hurricanes, tornadoes, droughts, wildfires, etc., are all in long-term downward trends as our planet modestly warms in its recovery from the recent Little Ice Age. Finally, sacrificing hundreds of millions of American birds and bats would do nothing to impact global temperatures. China alone emits more carbon dioxide than the entire Western Hemisphere. Even if the United States immediately cut emissions by 80 percent, new growth in Chinese emissions would render our reductions moot in less than a decade. Americans would suffer the negative economic and environmental consequences of eliminating conventional power generation, there would be no measurable impact on global temperatures, and Americans would be put at a competitive disadvantage producing goods and services while burdened with immensely high energy costs. President Obama, you keep your global warming plan, we’ll keep our aviary wildlife and our undeveloped lands. My speciality is species extinction. When I was a child, my father used to tell me about all the animals he’d seen growing up in Kent — the grass snakes, the lime hawk moths — and what shocked me when we went looking for them was how few there were left. Species extinction is a serious issue: around the world we’re losing up to 40 a day. Yet environmentalists are urging us to adopt technologies that are hastening this process. Among the most destructive of these is wind power. Because wind farms tend to be built on uplands, where there are good thermals, they kill a disproportionate number of raptors. In Australia, the Tasmanian wedge-tailed eagle is threatened with global extinction by wind farms. In North America, wind farms are killing tens of thousands of raptors including golden eagles and America’s national bird, the bald eagle. In Spain, the Egyptian vulture is threatened, as too is the Griffon vulture — 400 of which were killed in one year at Navarra alone. Norwegian wind farms kill over ten white-tailed eagles per year and the population of Smøla has been severely impacted by turbines built against the opposition of ornithologists. Nor are many other avian species safe. In North America, for example, proposed wind farms on the Great Lakes would kill large numbers of migratory songbirds. In the Atlantic, seabirds such as the Manx Shearwater are threatened. Offshore wind farms are just as bad as onshore ones, posing a growing threat to seabirds and migratory birds, and reducing habitat availability for marine birds (such as common scoter and eider ducks). I’ve heard it suggested that birds will soon adapt to avoid turbine blades. But your ability to learn something when you’ve been whacked on the head by an object traveling at 200 mph is limited. And besides, this comes from a complete misconception of how long it takes species to evolve. Birds have been flying, unimpeded, through the skies for millions of years. They’re hardly going to alter their habits in a few months. You hear similar nonsense from environmentalists about so-called habitat ‘mitigation’. There has been talk, for example, during proposals to build a Severn barrage, that all the waders displaced by the destruction of the mud flats can have their inter-tidal habitat replaced elsewhere. It may be what developers and governments want to hear, but recreating such habitats would take centuries not years — even if space were available. The birds wouldn’t move on somewhere else. They’d just starve to death. Loss of habitat is the single biggest cause of species extinction. Wind farms not only reduce habitat size but create ‘population sinks’ — zones which attract animals and then kill them. My colleague Mark Duchamp suggests birds are lured in because they see the turbines as perching sites and also because wind towers (because of the grass variations underneath) seem to attract more prey. The turbines also attract bats, whose wholesale destruction poses an ever more serious conservation concern. Bats are what is known as K-selected species: they reproduce very slowly, live a long time and are easy to wipe out. Having evolved with few predators — flying at night helps — bats did very well with this strategy until the modern world. This is why they are so heavily protected by so many conventions and regulations: the biggest threats to their survival are made by us. And the worst threat of all right now is wind turbines. A recent study in Germany by the Leibniz Institute for Zoo and Wildlife Research showed that bats killed by German turbines may have come from places 1,000 or more miles away. This would suggest that German turbines — which an earlier study claims kill more than 200,000 bats a year — may be depressing populations across the entire northeastern portion of Europe. Some studies in the US have put the death toll as high as 70 bats per installed megawatt per year: with 40,000 MW of turbines currently installed in the US and Canada. This would give an annual death toll of up to three -million. Why is the public not more aware of this carnage? First, because the wind industry (with the shameful complicity of some ornithological organisations) has gone to great trouble to cover it up — to the extent of burying the corpses of victims. Second, because the ongoing obsession with climate change means that many environmentalists are turning a blind eye to the ecological costs of renewable energy. What they clearly don’t appreciate — for they know next to nothing about biology — is that most of the species they claim are threatened by ‘climate change’ have already survived 10 to 20 ice ages, and sea-level rises far more dramatic than any we have experienced in recent millennia or expect in the next few centuries. Climate change won’t drive those species to extinction; well-meaning environmentalists might. Germany plans to build 60,000 new wind turbines — in forests, in the foothills of the Alps and even in protected environmental areas. But local residents are up in arms, costs are skyrocketing and Germany’s determination to phase out nuclear power is in danger. Still, he finds the wind turbine behind his garden fence harder to cope with. The tower is 180 meters (590 feet) high, and the whirr of the blades and grinding of the actuators are clearly audible. “When I leave my local bar in Heilbronn, 15 kilometers from here, I find my way home by heading for the turbine,” he quips. The wind turbine, an Enercon E-82, has been there for over a year. When it was inaugurated, the local shooting club, the “Black Hunters”, fired their guns in celebration, and the local priest delivered a sermon on protecting God’s creation. But not everyone is happy. Some are angry at the way the landscape, celebrated by German Romantic poets such as Hölderlin and Mörike, is being butchered. The opponents protest with images of the Grim Reaper holding a wind turbine rather than his traditional scythe. The situation in Husarenhof can be found across Germany. After the nuclear disaster in Fukushima and Germany’s swift decision to abandon nuclear energy and embrace renewable energy as part of its so-called Energiewende, the country’s 16 federal states reacted with a sort of excessive zeal. The northeastern state of Brandenburg plans to set aside 2 percent of its land for wind farms. The western state of Rhineland-Palatinate intends to more than double the amount of wind power it generates. North Rhine-Westphalia, its neighbor to the north, is planning an increase of more than 300 percent. With the prime coastal locations already taken, operators are increasingly turning their attention to areas further inland. Even valuable tourist regions — such as the Moselle valley, the Allgäu and the foothills of the Alps — are to be sacrificed. Sites have even been earmarked by Lake Constance and near Starnberg, where the Bavarian King Ludwig II drowned. At the moment, things are still in the planning, reporting and application stage. Local authorities’ filing cabinets are overflowing with authorization documents and wind strength measurements. Plans call for some 60,000 new turbines to be erected in Germany — and completely alter its appearance. But what’s really going on? Are politicians wisely creating the tools needed to prevent the end of the world as we know it? Or are they simply marring the countryside? The opponents carry coffins symbolizing the death of environmental protection. They organize petitions on an almost daily basis. Local residents by Lake Starnberg have even filed a legal complaint alleging that the wind turbines violate Germany’s constitution. The underlying divide is basic and irreconcilable. On one side stand environmentalists and animal rights activists passionate about protecting the tranquility of nature. On the other are progressively minded champions of renewable energy and climate activists determined to secure the long-term survival of the planet. The question is: How many forests must be sacrificed, how many horizons dotted with wind turbines, to meet Germany’s new energy targets? Where is the line between thoughtful activism and excessive zeal? At what point is taxpayer money simply being thrown away? Michael Succow, a prominent German environmentalist and winner of the Alternative Nobel Prize, is also threatening to abandon ship. He fears soulless stretches of land and lost tranquility. And his fears are not unfounded. Back in the 1980s, tree-huggers put up Aeroman wind turbines in their front yards — but those days are long gone. Just the masts of today’s wind turbines can reach up to 160 meters high. When active, they kill so many insects that the sticky mass slows the rotors down. The sweeping blades of the Enercon E-126 cover an area of seven football fields. The rotors of modern wind turbines weigh up to 320 metric tons. 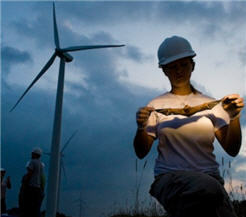 There are 83 such three-armed bandits in Germany’s largest wind farm, near the village of Ribbeck, northwest of Berlin. As they drive their SUVs through these turbine forests, tolerantly minded city-dwellers sometimes comment on how ugly eastern Germany has become. Others find them attractive — as they speed past. But local Nimbies (“Nimby” = Not In My Back Yard) are indignant. Apart from everything else, the value of their homes has plummeted. Nevertheless, their protests will do little to stop wind-turbine manufacturers from eagerly building taller and taller models. For the relatively weak inland winds to generate sufficient energy and profits, Germany’s wind farmers need to reach higher and higher into the skies. The goal is to get away from the turbulence found near the ground and to climb up into the Ekman layer, above 100 meters high, where the wind blows continuously. Up there, the forces of nature rage freely, creating enough terawatts to meet the energy needs of the global population hundreds of times over. Or at least that’s the theory. Inland, the “technical trend” toward bigger wind turbines “continues unabated,” according to a study recently published by the Fraunhofer Institute for Wind Energy and Energy System Technology (IWES). A visit to the IWES test center in the northern port city of Bremerhaven reveals what lies in store. The center is home to a next-generation rotary blade: flexible, wobbly even, weighing 30 metric tons and stretching 83.5 meters across. The mammoth prototype blade is currently at the testing stage. Hydraulic presses and cables bend and buffet the blade millions of times over, simulating the stress exerted by storms and gusts of wind. So, might we one day see wind turbines with blades stretching up almost 300 meters into the clouds — a somber memorial to Germany’s nuclear phase-out? Even hip urban fans of renewable energy think that would take some getting used to. Recent studies by bird protectors reveal how the giant blades chop up the air in brutal fashion. “Golden plovers avoid the wind turbines,” says Potsdam-based ornithologist Jörg Lippert. Swallows and storks, on the other hand, fly straight into them. The barbastelle bat’s lungs collapse as it flies by. A “terrible future” awaits the lesser spotted eagle and red kite, Lippert says. German citizens are also having to make sacrifices to meet the ambitious goals of the new energy policy. In England, large wind turbines must be situated at least 3,000 meters away from houses in residential areas. In Germany, which is more densely populated, local planners place turbines much closer to homes. In the southern state of Bavaria, for example, the minimum separation is 500 meters, while it’s just 300 meters in the eastern state of Saxony. In the early days, when everyone was still very excited about clean wind power, some farmers in northerly coastal areas allowed turbines to be erected even 250 meters from their cottages. And then they received large compensation payments when the noise from the rotors triggered stampedes in their pigsties. But now even those in northern Germany are grumbling. Many old wind turbines are being replaced with new, more powerful ones in a process known as “repowering.” Instead of 50 meters tall, these new turbines are more than 150 meters high, have flashing lights on them to prevent aircraft from hitting them and make a lot of noise as they rotate. The result? Complaints about the noise everywhere. Why do I call them bat-chomping, bird-slicing eco crucifixes….? June 17, 2013 – I wonder what it will take before the world truly wakes up to the horror, the corruption, the expense, the pointlessness, the total wrongness-in-every-way of the wind industry. My guess – and it will happen – is the decapitation, by a rogue turbine blade, of an innocent passer-by. Here’s another picture of the hapless gull, sliced into 2 pieces by a wind turbine. Careful, Marian. You now run the risk that someone from the wind industry will claim you chopped off that gull’s head yourself, probably because you are in the pay of Big Oil…. Consider the plight of the communities in Canada, where the wind industry is even more aggressive than it is here. One Ontario resident, Esther Wrightman so objected to the Golgotha of 400 foot wind turbines being planned for her area that she created a satirical website mocking the wind developer NextEra energy. She even filmed them chopping down a tree with an eagle’s nest in it in order to make way for the turbines. How did NextEra – market capitalisation $32 billion – respond to her not exactly unreasonable objections? Why by suing the pants off her, of course. So the anti-wind backlash has begun, of that there’s no doubt. In Australia, where resistance is especially strong, they’re holding a rally in the next few hours in Canberra to protest against an industry described by Alby Schultz MP as “the biggest government sponsored fraud in the history of our country”, so rife with “manipulation, intimidation, lies and cover-up” that there’s enough evidence to justify a royal commission. I wish I could be there at the barricades with my Aussie mates. Sounds like it’s going to be quite an occasion. As the bottom falls out of the man-made climate change industry, those who were among its most bullish investors at the height of the scam are now covering their positions in a bear market. Even the Intergovernmental Panel on Climate Change began to ratchet down its more extravagant predictions as early as 2007. In 2010 the Royal Society reviewed its stance on the Anthropogenic Global Warming theory and assumed a more neutral position. Since then, it has been like the retreat from Moscow: last month Oxford scientists, albeit in Delphic language, moderated forecasts of climate disaster. Last week the ultimate warmist zealot among the political class, Tim Yeo MP, executed a spectacular volte-face. In 2009 Yeo said: “The dying gasps of the deniers [sic] will be put to bed. In five years’ time no-one will argue about a man-made contribution to climate change.” Now, four years later, he is saying: “Although I think the evidence that the climate is changing is now overwhelming, the causes are not absolutely clear. There could be natural causes, natural phases that are taking place.” Within the Anthropogenic Global Warming hierarchy, that retraction is broadly akin to Richard Dawkins joining the Cistercian Order. The global warming hysteria began in the 1880s but was discredited when its prediction that CO2 would increase the mean global temperature by more than 1C by 1940 was not borne out. What gave it fresh life over the past two decades was the realisation by governments that it could provide a pretext for taxing citizens to unprecedented levels and by private entrepreneurs that government subsidies could supply a dripping roast. Of all the damage that politicians have inflicted on the public, the “green” scam has been among the most extreme. 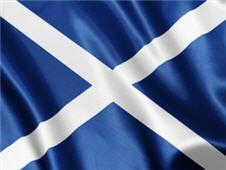 To read more, here’s the original article, “Wind of Change is Blowing from Scotland. In a previous partnership with Southern & Scottish Electricity (SSE), which invests in wind and other renewable energy, the RSPB admits to having made £1 million over ten years. 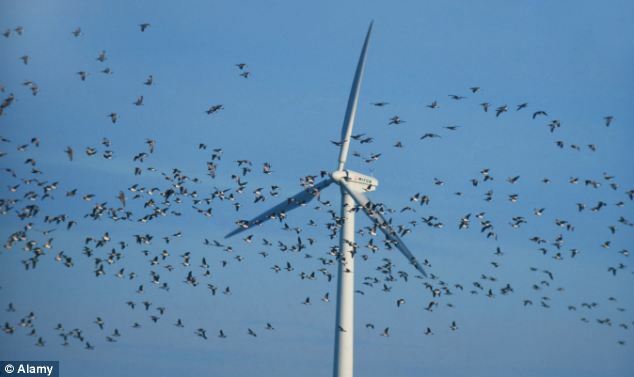 The charity claims that windfarms play an important role in the battle against climate change, which ‘poses the single greatest long-term threat to birds and other wildlife’, and that wind turbines caused only ‘significant detrimental effects’ when poorly sited. But critics argue there is no such thing as a well-sited windfarm and that the charity has been taken over by green zealots. Conservationist Mark Duchamp, whose international charity Save The Eagles monitors bird deaths caused by wind farms, said: ‘The fact that such an organisation [the RSPB] is not taking this problem seriously is scandalous. Dr John Etherington, former reader in ecology at the University of Wales and author of The Wind Farm Scam, said: ‘It seems to me that for some time now a green faction has penetrated a whole range of bodies and that the RSPB is one of them. ‘For an organisation that supposedly protects birds to team up with an industry that kills birds on the basis of unverifiable predictive models about climate change is just bizarre.